A lovely little chalet for a small group of friends with access to a courtyard hot tub! Chalet La Face is a delightful little chalet in the Le Cret area of Val d’Isere. The town centre and skiing are best accessed by hopping on the resort bus service that is both frequent and efficient. If you prefer to walk, the large selection of shops and bars are a 10 minute stroll from the chalet. The chalet sleeps 6 guests in 3 en suite rooms. The living room is both spacious and comfortable, with amazing views towards Tignes. The chalet has shared access to a very large hot tub too! 2nd floor: 3 twin rooms, all with bath/shower, basin, w.c. and balcony. (Rooms 1 and 3 have sloping eaves). Lounge/dining area. Log fireplace. Kitchen. Large balconies. 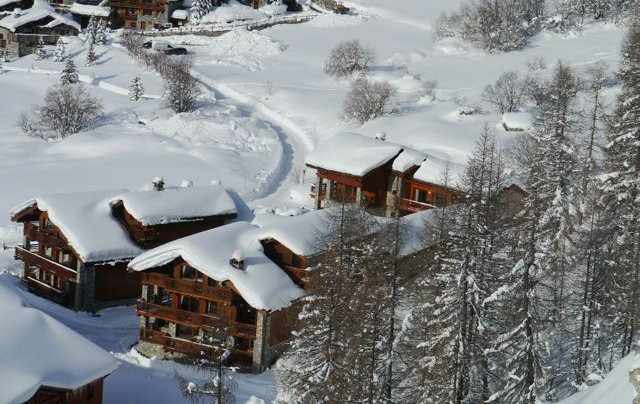 A bijoux little chalet, great for a small group of friends or a family looking for their own base in this iconic resort.